AnceStories: The Stories of My Ancestors: Richard V. Robbins of Pennylvania and Michigan: Is He Related to One of My Robbins Ancestors? 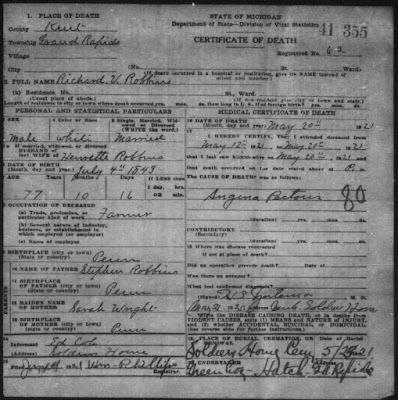 Richard V. Robbins of Pennylvania and Michigan: Is He Related to One of My Robbins Ancestors? 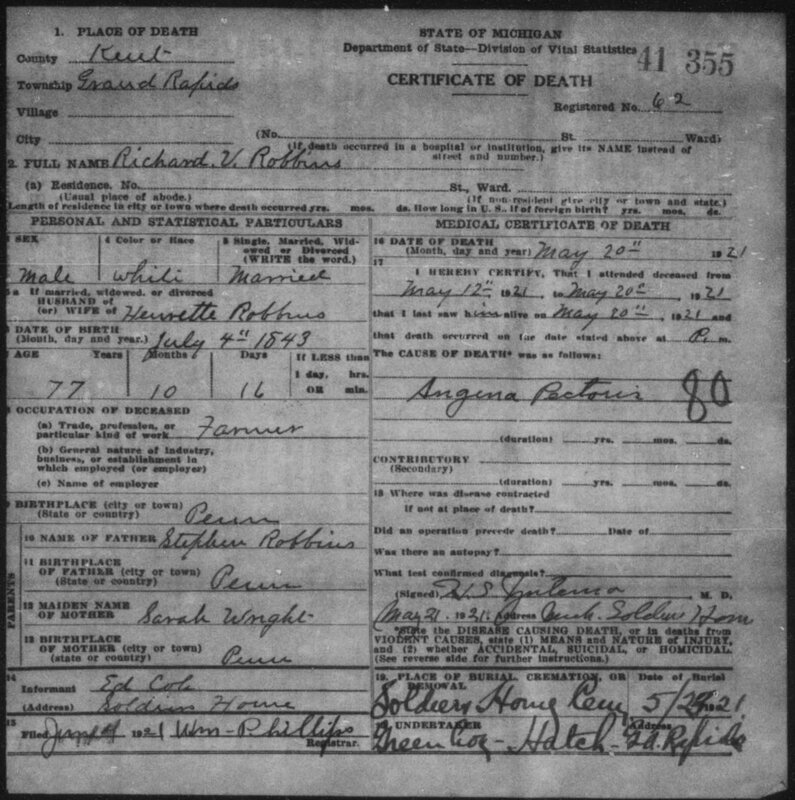 Michigan Department of Community Health, “Death Records, 1921-1947,” database with images, Seeking Michigan (http://cdm16317.contentdm.oclc.org/cdm/search/collection/p16317coll1), entry for Richard V. Robbins, 20 May 1921, certificate no. 41 355. One year ago today, I made a discovery on one of my Robbins lines (I have two). I have known from one of my cousins that there was a land transaction between Richard Robbins and my 4th-great-grandmother, Marinda (Robbins) Robbins in Oceana County, Michigan in the 1880s. I have been trying to figure out if Richard was a relative of Marinda, or of her husband/my 4th-great-grandfather Joseph Josiah Robbins. As I've mentioned often, my 4th-great-grandparents both had the last name Robbins. They married each other. They don't seem to be related, or if so, not closely. Joseph was born in Otsego County, New York and his father's name was George. Marinda was born probably in Broome County, New York or Susquehanna County, Pennsylvania (they border each other), and her father was Uzza Robbins. So one year ago, I took another look at Richard's death certificate. He was young enough to be Marinda's son, so it was doubtful he was her brother (we haven't identified all her siblings). Perhaps he was a nephew? I saw his parents were Stephen Robbins and Sarah Wright, and he was born in Pennsylvania. Looking through old notes and family tree info that was exchanged between myself and other Robbins genealogists, I saw that Stephen Van Rennselaer Robbins married Sarah Wright, and was a son of George Washington Robbins and Abigail Hicks, the couple I am 99% sure are also the parents of Joseph. Although most of George and Abigail's children moved directly from the Town of Westford, Otsego County to the Town of Carroll, Chautauqua County, New York, Stephen followed the same migration trail as my Joseph: living first in Elkland Township, Tioga County, Pennsylvania, then Liberty Township, McKean County, Pennsylvania, and then probably on to Oceana County, Michigan (I say "probably" because I don't know if Stephen did for sure...but his son Richard definitely did!). Stephen also joined the same unit that Joseph did during the Civil War: the 58th Pennsylvania Infantry. In their forties, they both would have been considered "old men" at that time. Joseph and Marinda's son Charles, my 3rd-great-grandfather, once declared in an newspaper interview before he died in 1934, that the family moved from Pennsylvania to Hesperia, Oceana County, Michigan near "where his aunt was living near Martin's lake in Newaygo county." I have long been trying to identify this aunt. Was she Sarah (Wright) Robbins? Also, Stephen's brother, George Robbins, Jr., bought land in Oceana County, and lived in Newaygo County, Michigan (the counties border each other, with the village of Hesperia lying on that border). It looks likely that Richard V. Robbins was Joseph's nephew, not Marinda's. The indirect evidence is mounting that Joseph Josiah Robbins was the son of George Washington Robbins and Abigail Hicks. I haven't found the direct piece of evidence; I may never find it. But the puzzle pieces are fitting together better than ever. It's time to find a direct male descendant of George and Abigail and (Y-DNA) test him against my dad! I also have Robbins' in my family tree. I have only gotten back to my 4th great grandfather Elisha R. Robbins and they have all been from Columbia and Luzerne counties in Pennsylvania. I wonder if we have any in common? Sorry for the delayed response. I keep forgetting that Google no longer notifies me by email of pending comments, and that I have to go check for them in Blogger. If we go back far enough, we'd likely find a connection. My Robbins lines tended to live in the Twin Tiers Counties, the counties that border each other in southern New York State and northern Pennsylvania. And I just found some pretty solid information that leads me to believe my Joseph Robbins line descends from George Robbins of Chelmsford, Middlesex Co., in what was then the Massachusetts Bay Colony (late 1600s). My Uzza Robbins line comes out of Lyme, New London Co., Connecticut.